When the two of us touched down in Dublin on Thursday evening, there was no plan for the trip aside from sampling the local nightlife. As with our trip the previous year to Prague, four of us flew out separately, however today there was a day between our flights. We needed something to do! Over a few pints in Fitzsimons, we decided to hire a car the next day and explore the countryside. Problem is, we had until 7pm to meed with James and Paul, so time would be limited. Realistically, we had about 8 hours to do a round trip, giving us time for a decent length lie in. The start of every great idea! Bringing up Google maps, we had a look at all the places we could get to in that time. Giant’s Causeway? Too far. A trip to Cork? Again, too far. 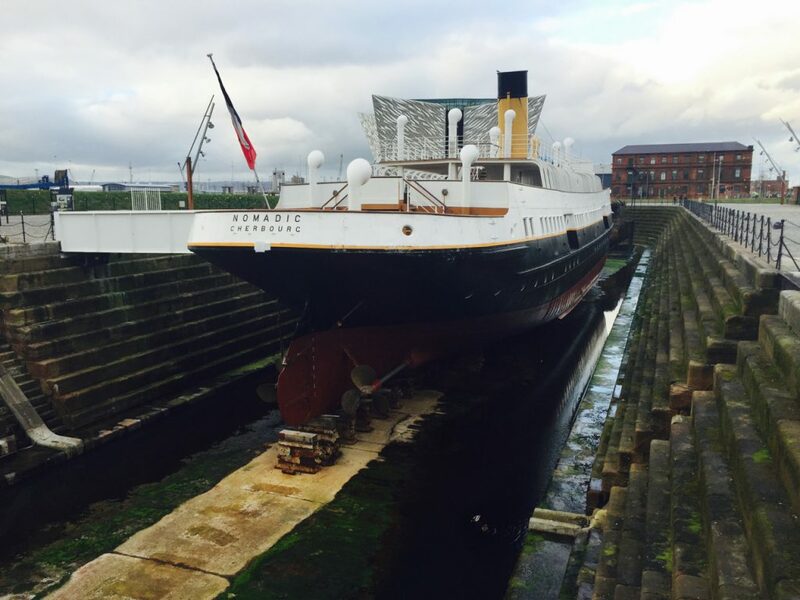 Belfast – home of the Titanic? This was actually in reach. 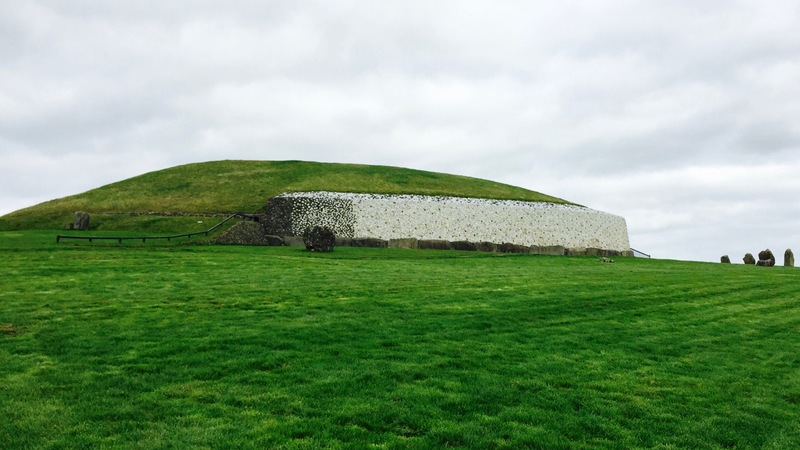 Then, we discovered Newgrange, a prehistoric monument that’s 600 years older than Stonehenge, that was en-route. Not wanting to pass up on two hits of history, we got on the phone to our wheeler-deeler Enterprise Rent-a-car mate. Good news – he could secure us a vehicle with a mates-rates discount. The following day we arrived at the Rent-a-car office to pick up our rental whip. While we had booked a ‘compact’, it turned out they had none in stock. We’d have to pony up extra to get a Vauxhall Insignia, which in hindsight was a lot more car than we needed for one afternoon. We also had to pay extra to get a diesel, though it turns out diesel is cheaper than petrol in Ireland, which would have got us closer to breaking even on the upgrade. 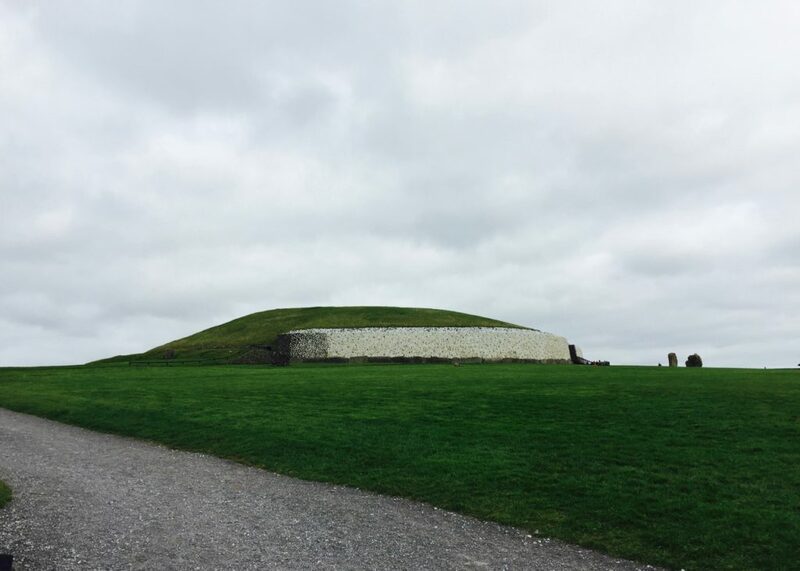 After we figured out how to use the unintuitive sat-nav and had Newgrange dialled in, we hit the road, while mercilessly being subjected to the local radio stations. It was only towards the end of our return journey that we discovered the car had both bluetooth and an aux-in port. An hour or so later we arrived at the Newgrange car park in the Boyne Valley and took a short walk across to the welcome centre. Realising that we’d have to wait about half an hour to take a 15 minute mini bus ride across to the site, we spent the time drinking coffee and finding out more about this stone age wonder – in truth we had no idea what it was when we planned to visit it. Turns out it’s 5,200 years old, making it older than Stonehenge and the Pyramids in Egypt. It’s also the oldest structure with a roof, which is pretty impressive considering it’s still standing. 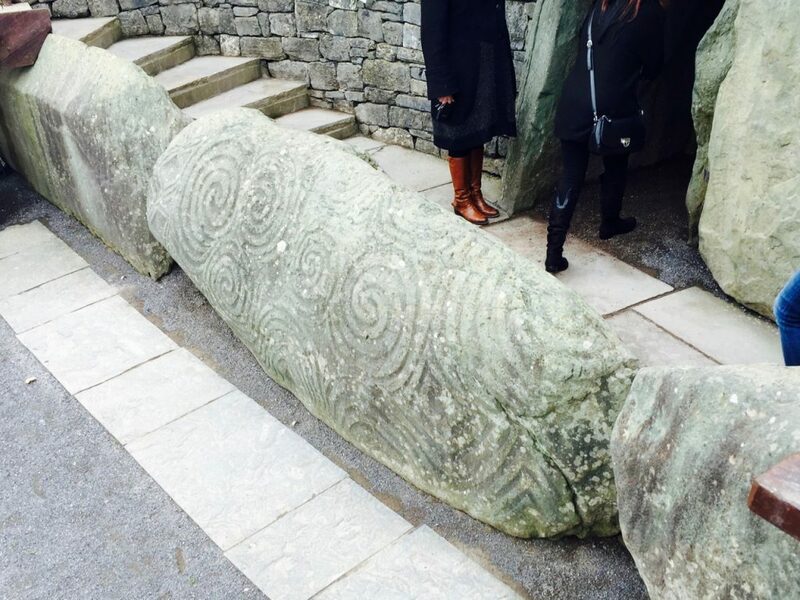 These ancient carvings are several thousand years old! We headed over there and were taken in, led by a guide. No one knows why the structure was built because it predates the invention of writing, however, experts believe it’s some sort of temple. That’s because on December 18th to 23rd, the chamber in the middle of the temple, which is usually pitch black, is lit up for a few minutes by the winter solstice sun. Could it be for some religious reason? And how did the builders line up the angle for the light to come in so perfectly without anything to draw a plan on? The sensation was simulated by turning out the lights and turning on a lamp where the sun would appear, giving the central chamber an eerie glow. Looking around inside once the main lights were back on, we found that people had actually entered the chamber at various points in the last 500 years, graffitiing the inner walls. Their tags have actually become part of the history of the site, and it’s interesting to see a 1654 version of “Gaz woz ere” on the wall. Not much has changed! Overall, glad we stumbled across this and paid it a visit. 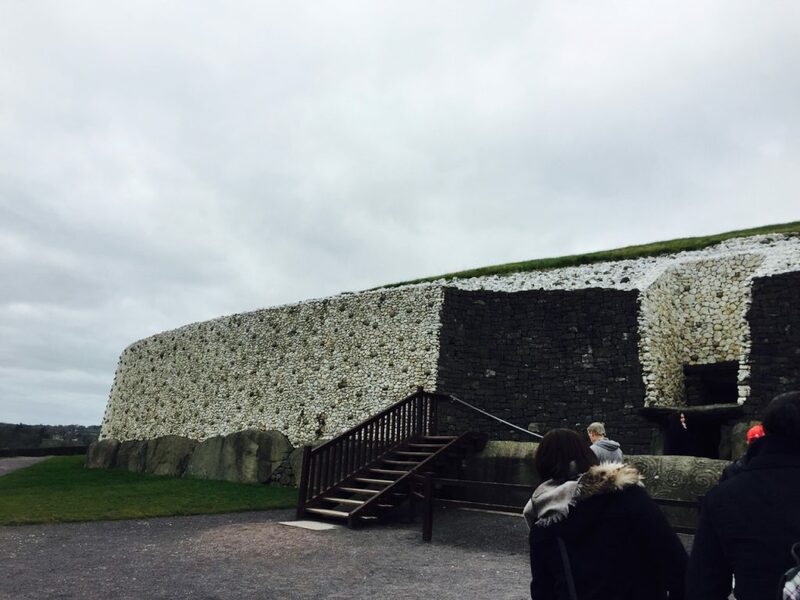 It’s surprising that Newgrange is so under the radar considering how incredible it is that a 5,200 year old building is still standing today, build around the same time that the wheel was being invented. And with that, it was back to the Vauxhall for another hundred miles to go until we arrived in Belfast. Annoyingly, the car didn’t show mph as well as kmh, so sticking to the speed limit across the border was largely guess work. There was also no notice that we’d entered the UK, aside from getting repeatedly overtaken when driving at 60 kph until you realise the road signs had slightly changed in design. After several laps of the one way system trying to find a car park, we had arrived and went to check out the place where the Titanic was built. Unfortunately by the time we had arrived the Titanic museum had closed, leaving us with just the SS Nomadic, which is basically the 1911 version of a airport shuttle bus, taking guests to the Titanic when moored off the coast of Cherbourg en route to New York. Unfortunately the Titanic Museum, built on the site of the dock where the famous ship was built, wasn’t open that day. 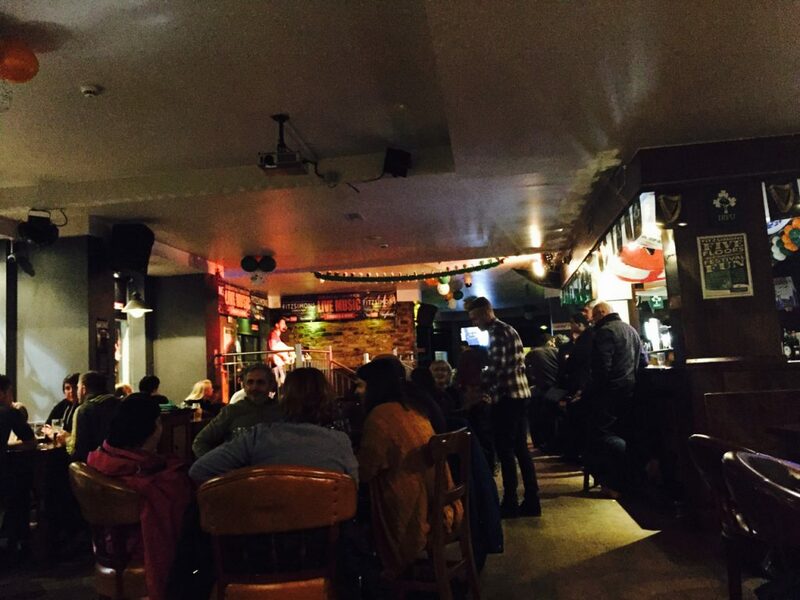 We had time for dinner in Belfast at a local pub, before needing to head back to Dublin airport to pick up our mates. As we drove back we realised the car rental shop was closed, so we’d have to park the car somewhere overnight and return it the following morning. Not only was I anxious at the prospect of having to wake up hungover in time to return the car by 10, we weren’t sure where to park. Our hotel was parallel to O’Connell Street, right in the city centre. As it happens, parking is actually very cheap in the city centre. The nearest multi-storey was just around the corner and had a special rate of €2.80 for visitors of local hotels. All we needed was a stamp from the front desk. Should you rent a car on your trip to Dublin? There’s plenty more to discover in the Irish countryside than we had time for, so if you’re spending a week in Dublin, then it’s worth hiring a car and exploring. If you’ll be using the car for more than a few hundred miles then it’s worth getting a diesel which is more fuel efficient, though the Vauxhall Insignia is best avoided due to it’s floaty handling, confusing electronic parking brake and non-user friendly infotainment system!